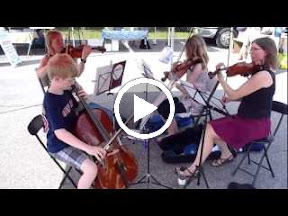 My first year playing music at the Belmont Farmers' Market, I played the viola. If you look carefully in those pictures from 4 years ago, you'll see a little tow-headed 4-year-old sitting on the curb, not looking at the camera. That 4-year-old is now 8, and a few months ago, in the early spring, he decided he wanted to play the cello. He'd actually been saying this for a while. I'm not sure where it came from. He expressed an interest in the string bass first, and while he's tall for his age, our school system doesn't start kids on bass until 6th grade. The cello has some similarities: it's tall and it's low in pitch. I personally think it's nicer to listen to than the bass, and unlike the violin, you always get to sit down while you play. One thing that seems to be very characteristic of him in many areas of life: he wants to do his own thing. No violin or viola for him! We played again at the market this year. After playing for 3 and a half months, my son was willing to try some easy Irish tunes, and rounds. He has been taking lessons from my daughter's teacher and occasional stand partner in the Arlington Philharmonic, shown here on 2nd violin (and me on 3rd). So, in our family, we now have 3/4 of a string quartet: my daughter on 1st violin, my son on cello, and me on violin or viola, depending on what's needed. Now we just have to teach my husband to play something . . . The good news is that you have a string trio. There is some wonderful literature for that configuration including Beethoven, Schubert, and some others. If your husband will not cooperate by learning viola, to fill out the foursome, you could try to have another child (lol). When my son was young, he had a friend named John Freivogel. Although John's parents had no discernable musical ability (one was tone deaf, I think), he had a brother and two sisters, and all four were spectacular musicians. John and one sister played violin, another sister played viola, and the brother played cello. They performed as a quartet all over the place including the Kennedy Center. They all became professional musicians, if I remember correctly, and the two sisters are part of a professional quartet called the Jupiter Quartet. Congratulations to all for a job well done! What a pleasure it will be for you to make music in your home! Karen - for some reason, the site is hiding my name when I respond. First response is mine. Nice work -- I played both tracks. This brings back memories. "Bonnie Doon" is a piece I learned in the first few months of lessons. I'm looking at the music right now in a book my first teacher left to me. "… he wants to do his own thing." Sounds like me. After my parents enrolled me in elementary piano lessons, the violin caught my fancy, and I told them I wanted to make the switch. They agreed to this. No one else in my family had played this instrument. Jim, I was like that too. My parents aren't musicians and so I'm grateful for the public school program that introduced me to violin. I decided to play the instrument after reading about Pa's fiddle in the "Little House" books by Laura Ingalls Wilder. It is a nice thing to do with kids, so I'm glad to have the experience as a parent! Tom, that happened on the other blog too, that your name was left off (But I still knew it was you ;-). It looks fine on your second comment here though. Weird!